With winter coming at us full bore, heading to next weekend’s Progressive International Motorcycle Show at Cleveland’s IX Center is a must. 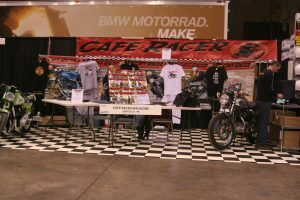 Stop by Cafe Racer magazine’s booth and check out a couple of the recent custom bike builds that have been featured in the mag, and sign up for a subscription and receive a free T-shirt. Editor Mike Seate will be along, making guest appearances at the Royal Enfield booth, telling anyone and everyone how awesome the new 650 twins are. The fun starts Friday, January 25 at 3 p.m. and runs non-stop until Sunday at 6.